Tourette Syndrome (TS) appears to be an inherited disorder, although genetic abnormalities have been identified in less than 1% of patients, and the mode of inheritance is uncertain. Many studies have investigated environmental factors that might contribute to the onset and severity of tics and associated comorbidities such as obsessive compulsive disorder (OCD) and attention deficit hyperactive disorder (ADHD). A systematic review and qualitative analysis were performed to provide a broad view of the association between pre- and perinatal factors and TS. The Medline, Embase and PsycINFO databases were searched using terms specific to Tourette’s syndrome and keywords such as “pregnancy”, “prenatal”, “perinatal”, “birth” and “neonatal”. Studies were limited to studies on human subjects published in English or French through October 2012. 22 studies were included. Studies were of limited methodological quality, with most samples derived from specialty clinics, and most exposures ascertained retrospectively. The majority of the results for demographic factors of parents, including age, education, socioeconomic status, and marital status, revealed no significant association with the onset of TS, or the presence of comorbidity. Many factors were reported to be significantly associated with the onset of TS, the presence of comorbidity and symptom severity, but the most consistently reported factors were maternal smoking and low birth weight. There are few studies evaluating the relationship between pre and perinatal events and TS, and existing studies have major limitations, including the use of clinic rather than epidemiologically derived samples, retrospective data collection on pre and perinatal events and multiple hypothesis testing without appropriate statistical correction. The mechanism by which prenatal and perinatal adversities could lead to TS onset or symptom severity is unknown, but may be related to changes in the dopaminergic system as a result of early brain injury. Tourette Syndrome (TS) appears to be an inherited disorder, although genetic abnormalities have been identified in less than 1% of patients, and the exact mode of inheritance has not been determined . Some genetic studies have reported infrequent associations of specific genes with TS, including the mutation of SLITRK1 encoding SLIT and NTRK-like protein 1 and a rare functional mutation in the HDC gene encoding L-histidine decarboxylase [2–9]. While current research suggests that genetic factors confer the greatest risk for the development of TS, many studies have investigated environmental factors that might contribute to the onset of TS, associated comorbidities and more severe symptoms. Among these environmental factors, many studies report that pre- and perinatal factors may play an important role in the pathogenesis of TS [10–28]. However, analysis of these studies has revealed inconsistent results. We performed a systematic review to gain a complete perspective on the association between pre- and peri-natal adversities and TS, including the onset of symptoms, symptom severity, and the presence and severity of comorbidities. There are no up to date systematic reviews focusing on this issue. 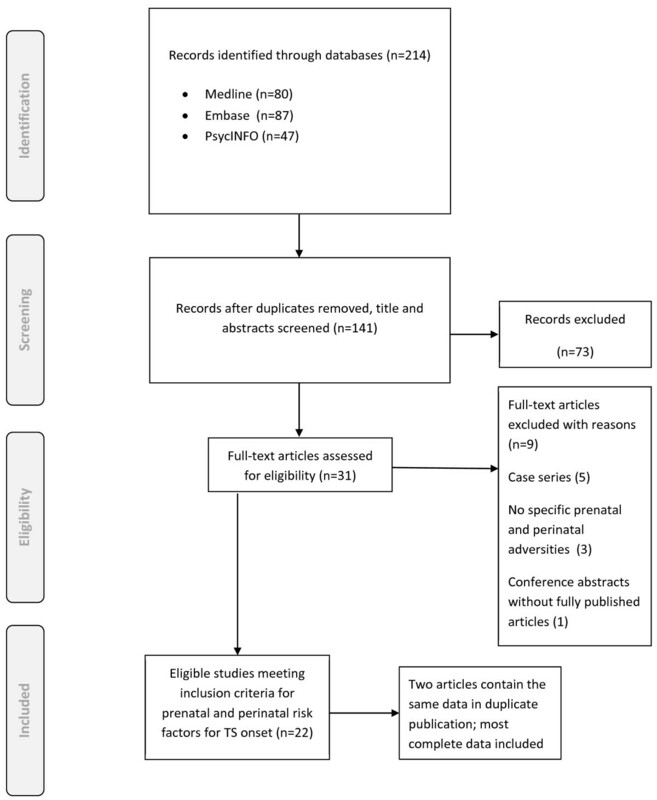 In this article, a systematic review and qualitative analysis were performed to provide a broad view of the association between pre- and perinatal factors and TS. The Medline, Embase and PsycINFO databases were searched using terms specific to Tourette’s syndrome and keywords such as “pregnancy”, “prenatal”, “perinatal”, “birth” and “neonatal” (Additional file 1). Studies were limited to studies on human subjects published in English or French through October 2012. Two reviewers independently screened the titles and abstracts. Review articles, commentary articles, editorials, animal studies, and case-reports were excluded. Potentially relevant articles for full-text review were identified by reading abstracts and titles. Full text review was performed on any study for which the abstract or title suggested that the study evaluated pre or perinatal risk factors associated with the development of TS or related to TS severity. Disagreements were resolved by consensus between the two reviewers. Full texts of the selected articles were further reviewed and the following criteria were used to include articles for data extraction: 1) studies specific factors in the prenatal and perinatal period 2) evaluates association with the diagnosis or symptom severity of Tourette syndrome or its comorbidities 3) original study with fully published article available. The following information was extracted onto piloted forms: 1) First author, year and geographic location of the study 2) case definition and ascertainment, sources and numbers of cases and controls, matching factors 3) severity scales for Tourette’s syndrome or its comorbidities 4) specific risk factors 5) study results, including risk estimate and indicators of statistical significance. The electronic searches yielded 141 abstracts, with 31 abstracts selected for full-text review [10–40]. After full text review of these 31 articles, 9 were excluded because only case series were studied [31, 32, 35, 37, 38], only poster abstract was available , or the contents didn’t include pre- or peri-natal adversities [10, 34, 40]. Because of the extreme diversities among studies, the included 22 articles were further categorized according to the different purpose, study design, investigated factors, and outcome. In these 22 articles, two of them were duplicates of data [11, 14]. Therefore, the data in one report was selected according to the completeness of data contained in both reports  (see Figure 1). PRISMA flow diagram of included studies. Of the 21 studies reporting original data, three were prospective cohort studies, nine were case control studies, four were single group cross sectional studies evaluating disease severity, one was a cross-sectional study with matched case–control pairs, three were twin or family studies, and one was a multiple case group comparative study. The three prospective cohort studies collected pre- and perinatal data prospectively. Two case control studies used pre- and perinatal data recorded on registered birth certificates at the time of delivery, and one cross-sectional study examined children for minor physical anomalies. The remaining fifteen studies collected pre- and perinatal risk factor data retrospectively through parental interview. With the exception of the three prospective cohort studies and one case control study, all samples of cases were derived from speciality clinic settings. See Table 1 for information on study design, sources of cases and controls, data collection and risk factors studied. This was a prospective cohort study of low birth weight babies who were examined at age 6 for psychiatric disorders including TS. The study examined the relationship between neonatal cranial ultrasound abnormalities in these children and the diagnosis of psychiatric disorders at age 6. There were 14 articles investigating individual pre- or peri-natal factors associated with the onset of TS, risk for comorbidities such as ADHD or OCD, or different genders in TS [11–23]. The summarized results are shown in Table 2. Because of diverse methods for measurement of the risk factors among studies, the results are presented according to the original definition by each study. Similar factors were grouped together but quantitative summarization was not possible because of small sample sizes and the diversity of studies. *TS versus controls if not indicated. ADHD: Attention deficit hyperactive disorder; BW: birth weight; CI: confidence interval; NS: non-significant; OCD: Obsessive compulsive disorder; OCS: Obsessive compulsive symptoms; OR: odds ratio; TS: Tourette’s syndrome, statistically significant results shown in bold. In Table 2, the majority of the results for demographic factors of parents, including age, education, socioeconomic status, and marital status, revealed no significant association with the onset of TS, or the presence of TS comorbidity such as ADHD [11, 13, 14, 17, 20]. There was only one small study (25 cases and 25 controls) in which the mother’s age in the group with TS was significantly younger than the control group (20 ± 1.4 versus 23 ± 3.4, p < 0.01) . For pre-conception health status, major health problems prior to pregnancy were not associated with the onset of TS, or TS comorbidity, according to the results of two published studies [15, 17]. During the prenatal period, many studies found that some prenatal adversities were significantly associated with the onset of TS or comorbidities, although the results were not consistent (Table 2). Burd (1999) reported that TS was associated with earlier prenatal care and more prenatal visits compared to the control group . One cross sectional study evaluating the association between minor physical anomalies and TS suggested that early insults during pregnancy might be associated with the onset of TS, as children with TS had a significantly higher number of minor physical anomalies . In 4 studies investigating the association between pregnancy complications and TS onset, the presence of comorbidity, or gender, one study showed a borderline association of one or more pregnancy complications with TS onset (OR = 2.33, 95% CI = 0.92-5.89, p = 0.069) . Another study demonstrated that one or more pregnancy complications were significantly associated with TS with comorbid ADHD compared to controls, but not associated with TS only patients . One study found that the overall number of prenatal problems was associated with a higher risk of ADHD comorbidity (OR = 2.97, 95% CI: 1.27-6.94, p = 0.02) . Some individual and combined factors during pregnancy were also investigated, including maternal hypertension, psychosocial stress, antibiotic exposure, or medications/procedures [17, 19, 21]. In these studies, psychosocial stress was not significantly associated with the onset of TS or TS with ADHD compared to controls. In another study, antibiotic exposure was significantly associated with both TS and TS with ADHD (p = 0.02) . With regard to maternal smoking, one study revealed borderline results in the association with onset of TS or TS with ADHD compared to the control group. The odds ratios were very high: TS (OR = 4.6), TS with ADHD (OR = 8.5) (Table 2) . The study found that TS with ADHD had an even higher association with maternal smoking than TS only. This trend was also noted in another study- that compared to TS only patients, the presence of ADHD comorbidity was significantly associated with maternal smoking during the prenatal period (adjusted OR = 2.43, 95% CI; 1.23-4.82, p = 0.01) . Maternal smoking was also reported to be associated with a borderline higher risk for OCD (OR = 8.27, 95% CI = 0.87-78.20, p = 0.07) . In another study combining coffee, cigarettes, and alcohol exposures as one single factor, the presence of comorbid OCD with TS was significantly associated with these exposures compared to TS only patients (OR = 5.0, 95% CI: 1.3-19.4, p < 0.05) . In summary, although there were no consistent results among studies, many factors were reported to be significantly associated with the onset of TS or the presence of comorbidities in TS patients. These factors included earlier prenatal care, more prenatal visits, pregnancy complications, antibiotic exposure, maternal smoking, and coffee, cigarette, and alcohol exposure. Prenatal adversities during a critical developmental stage may be associated with the onset of TS or the development of comorbidities in these patients. The association between TS and perinatal risk factors was reported in 6 articles (Table 2) [11, 15, 17, 19, 21, 22]. These studies suggest that while some perinatal risk factors were associated with specific conditions, the results are inconsistent. Among them, delivery complications were noted more frequently in boys with TS compared to girls (OR = 9.4, 95% CI: 1.01-87.3, p < 0.05) . Forceps delivery was associated with the presence of OCD in TS patients compared to TS only (OR = 7.9, 95% CI: 3.2-19.5, p < 0.01) . In addition, Iida reported that perinatal complications were associated with the presence of obsessive-compulsive symptoms in TS patients compared to TS only . For the onset of TS, Burd et al. (1999) reported that the Apgar score at 5 minutes was significantly lower in children with TS compared to controls (8.396 ± 1.446 vs. 8.789 ± 1.123, p = 0.028) . Although significant associations between TS and the perinatal factors described above were reported in these 6 articles, many of these articles revealed non-significant results for different measurements. Compared to prenatal factors, a relatively smaller proportion of results for perinatal factors revealed significant associations with TS. When prenatal and perinatal adversities were considered as one factor, only one of 3 studies revealed significant associations of prenatal and perinatal adversity with TS (OR = 16.55, 95%CI = 3.54-77.40, p < 0.001) or chronic tics (OR = 14.00 95%CI = 3.00-65.44, p < 0.001) (Table 2) . However, in the other two studies, no associations were reported [13, 18]. The relationship between gestational age, birth weight, birth order and TS has been investigated in several studies (Table 2) [11, 15–17, 20, 21]. Most studies reported non-significant results for these factors. In 4 articles investigating gestational age, only one study revealed that the presence of ADHD in TS patients was significantly associated with prematurity (<37 weeks) compared to TS only patients in an unadjusted evaluation (OR = 3.83, 95% CI: 15.1-9.69, p < 0.01) . The same study also found that low birth weight (<2500 g) was associated with a higher odds of comorbid TS and ADHD (OR = 2.74, 95% CI: 1.03-7.29, p = 0.04) . Another study found that higher birth weight was associated with a lower risk of ADHD comorbidity in TS patients (OR = 0.69, 95% CI: 0.52-0.92, p = 0.02) . In a twin study where only one twin was affected by TS, lower birth weight was noted in the TS twin compared to their disconcordant twin without TS (TS twins: 2228 ± 244 gm vs. Twins without TS: 2545 ± 216 gm, paired t test, p = 0.006) . For birth order, both studies found that it is not associated with the onset of TS [15, 20]. There were 5 articles investigating the association between pre- and perinatal factors and the severity of tic symptoms and comorbidities [24–28]. All articles included only TS patients using a single group cross sectional design with comparison of disease symptom severity between those exposed and not exposed to perinatal adversity. All of the significant and non-significant results in these articles were summarized in Table 3. ADHD: Attention Deficit Hyperactive disorder; C-GAS: Children's Global Severity Scale; CI: confidence interval; CSBQ: Children's Social Behavior Questionnaire; CYBOCS: Children's Yale-Brown Obsessive-Compulsive scale; DRD4: Dopamine receptor D4; MDD; Major Depression Disorder; NS: non-significant; OCD: Obsessive Compulsive Disorder; OCS: Obsessive-Compulsive Symptoms; OR: odds ratio; RCADS: Revised Child Anxiety and Depression Scale; TS Tourette’s syndrome; YGTSS: Yale Global Tic Severity Scale; Borderline (0.05 < = p <0.10) or significant (p < 0.05) results are marked with the association directions, statistically significant results shown in bold. Some prenatal factors were reported to be significantly associated with the severity of tic symptoms or comorbidities (Table 3). Pregnancy complications which included hypertension, infections, (pre)eclampsia, psychosocial stress, or diabetes mellitus were reported to be associated with greater tic severity at a single time point as measured by the Yale Global Tic Severity Scale (YGTSS) . However, these pregnancy complications were found to be associated with lower mean compulsive CYBOCS ratings in these patients . In addition, severity of nausea/vomiting during pregnancy was also noted to be associated with current tic severity as measured using the TS Global Scale based on all available information (direct examination, review of videotapes, parental- and self-reports, school reports, and medical records) . With respect to in utero medication exposure, this was associated with global tic severity and a borderline higher risk for obsessive compulsive symptoms but a lower risk for symptoms of ADHD in individuals with TS . In addition to the prenatal factors mentioned above, some studies have investigated the association of tic severity or comorbidity severity with maternal smoking, maternal alcohol use, psychological stress during pregnancy, and the overall number of prenatal problems (Table 3). More severe ADHD rating scale scores, measured with the parent version of the ADHD Rating Scale, were associated with maternal smoking (smoking versus non-smoking: 26.4 ± 10.1 versus 19.1 ± 10.9, p = 0.05) . This association was more prominent when there was a positive family history of mental disorders (p = 0.04) . In another study, higher depression and autism scale scores, measured with the major depressive disorder subscale of the revised Child Anxiety and Depression Scale (RCADS) and the parent version of the Children’s Social Behaviour Questionnaire (CSBQ), were noted in TS patients with a history of exposure to maternal smoking . Maternal smoking was also reported to be associated with greater worst ever lifetime tic severity as measured by the YGTSS, and more obsessive compulsive symptoms in another study . These results suggest an association between maternal smoking and tic, ADHD and OCD severity in individuals with TS. In addition to maternal smoking, maternal psychological stress was noted to be associated with greater tic severity . With regard to the prenatal alcohol exposure, there was no association between maternal alcohol use and tic severity or ADHD comorbidity . The presence of delivery complications including meconium-stained amniotic fluid, premature rupture of the membranes, nuchal cord, fetal bradycardia, placenta praevia, or artificial delivery was reported to be associated with higher worst ever tic severity (presence versus absence: 28.7 ± 9.1 vs. 23.4 ± 7.3, p = 0.01) as measured by the YGTSS . Dopaminergic genes are candidate genes in TS studies given that alterations in dopaminergic neurotransmission are believed to contribute to the etiology of tics. In a study investigating the interaction between the dopamine receptor D4 (DRD4) gene and perinatal factors associated with tic severity, TS patients with the DRD4 3R allele and a history of delivery complications had a lower total tic scale rating, measured with the YGTSS, compared to individuals without the DRD4 3R allele (p = 0.02) . The same study also found that in patients with the DRD4 2R allele, higher total anxiety ratings and total Revised Child Anxiety and Depression Scale scores (RCADS) were noted in TS patients with delivery complications (p = 0.004 and 0.006 respectively). These results suggest an interaction of genetic and environmental factors on the severity of tics and associated comorbidities in TS patients. In a twin study evaluating birth weight and lifetime tic severity, the twin with lower birth weight had higher tic scores measured with Shapiro Symptom Check List and YGTSS . In the same study, the within-pair body weight difference was linearly correlated with the within-pair tic score difference measured with the Shapiro score (rho = 0.72, p < 0.005) . These findings suggested that lower birth weights were associated with the greater tic severity between identical twins. In addition, these associations had a linear dose–response relationship. These results suggest that lower birth weight is associated with higher tic scores in TS patients. There was one article investigating time trends in the incidence of Tourette syndrome in a population-based cohort . In this study, a statistically significant increase was found in the cumulative incidence across specific birth years for TS from 1990 to 1995. For example, for children age 9, the cumulative incidences are 2.3 (95% CI: 1.4-3.1), 2.4 (95% CI: 1.5-3.2), and 3.9 (95% CI: 2.9-4.9) for birth cohort in 1990–1991, 1992–1993, and 1994–1995, respectively. The study could not identify if there were environmental factors including pre- or perinatal adversities associated with this increase in incidence, or whether this was due to an improvement in identification and diagnosis of tic disorders over this time period. Another study was performed using the same cohort data to evaluate the seasonal variation in the incidence of TS. The results found that there was no evidence of seasonal variation of birth and TS incidence . Some indirect evidence also suggests that perinatal difficulties may play a role in the onset of TS. In one study investigating TS probands and relatives’ risks for TS, perinatal difficulties in TS probands were inversely related to the recurrence risk among first-degree relatives of TS probands . This suggests that TS probands with perinatal problems had a lower risk of TS in first degree relatives. It provides indirect evidence that part of the risk for TS in these probands was related to these perinatal insults. In another study investigating the association between neonatal cranial ultrasound abnormalities and the prevalence of tic disorders in low-birth-weight children, the prevalence of tic disorders at age of 6 was significantly associated with parenchymal lesions and/or ventricular enlargement in neonatal cranial ultrasound examinations (OR = 8.7, 95% CI: 1.3-57.7, p = 0.02) . These results suggest that neonatal brain injury might increase the risk for the onset of tic disorders. Overall, there were few articles investigating the association between pre- and perinatal adversities and the onset and severity of TS, and the presence and severity of comorbid disorders. Although some studies have reported associations between pre- and perinatal factors and TS, many of the results are inconsistent. Taken as a whole, there is only very weak evidence to support that pre- and perinatal adversity are associated with the development of TS, TS symptom severity and the presence or severity of comorbidities. One of the major issues regarding the available literature on the relationship between TS and pre and perinatal risk factors is the overall poor methodological quality of the studies performed to date. Only five studies evaluated data on perinatal events that was collected prospectively on registered birth certificates or as part of a birth registry. The majority of studies used clinically ascertained samples of individuals with TS, which may differ substantially in disease severity than those ascertained through population based means. The available data are therefore susceptible to bias. In comparing the results of the case control studies using birth certificate data with those who ascertained information about perinatal events from mothers retrospectively, there is no clear difference in the strength of association between TS and various perinatal risk factors. Burd  reported significantly earlier prenatal care, more prenatal visits, a lower odds of having care begun after the first trimester (three highly related factors), and lower Apgar scores at 5 minutes among cases than controls. Pasamanick  did not detect any significant relationships between abnormalities during the pre or perinatal period and TS. Of the five studies examining the relationship between perinatal adversity and TS and comorbidity symptom severity, the majority of positive results reported would not remain significant after appropriate statistical correction for multiple hypothesis testing. The exception is the finding reported by Matthews  of the association between increased global tic severity and the number of medications reported in utero and maternal smoking (both p < 0.00001). Of all the risk factors studied, maternal smoking and low birth weight appear to be the only risk factor with consistent significant associations. Maternal smoking was reported to be associated with the presence of comorbid ADHD and OCD, and TS, ADHD and OCD symptom severity. Although these results suggest a connection between maternal smoking and the onset of TS, other factors linking these exposures to TS need to be considered. Nicotine has a therapeutic effect for some TS and ADHD patients [41–46]. Nicotine has been shown to reduce complex tics and improve behaviours related to inattention in TS patients . Individuals with ADHD have a higher risk of smoking and nicotine dependence from adolescence to young adulthood . If mothers with tics or ADHD smoke, the association of maternal smoking and TS in the offspring might be due to heritability of these disorders rather than smoking itself. Many individuals are unaware of their tics and are never diagnosed with TS and therefore may deny a family history of the disorder. This confounding effect should be carefully examined in future studies to clarify the association of prenatal smoking exposure and the onset or severity of TS, and the presence and severity of comorbid ADHD and OCD. Most studies did not report significant associated neonatal factors with TS, except for low birth weight. Low birth weight was found to be associated with comorbid ADHD and tic severity. Low birth weight may be an independent factor associated with TS or comorbidities, or may be a consequence of prenatal adversity. Although this effect would be minimized in twin studies, further investigations are necessary to identify whether low birth weight itself is associated with TS or if it is the proxy of other prenatal insults. The limitations of this systematic review include the overall poor methodological quality of the included studies, with differing study designs and analytic methods, and extreme diversity of measurements among different studies. Definitions of prenatal or perinatal adversities differed between studies, and were most commonly retrospectively ascertained. Finally, as the clinical symptoms of TS wax and wane during the disease course, the measurement of tic severity at a single point of time does not truly represent disease severity for patients. Although it is difficult to draw a valid conclusion from this literature, many pre- and perinatal adversities were reported to be associated with the onset of TS, the presence of comorbidities, and the severity of tics and comorbidities. Future studies are likely to make a significant contribution, especially if they include population derived cohorts, use data on perinatal events that was obtained prospectively, and use methods to control for multiple hypothesis testing. Standards for defining pre and perinatal events should be adhered to, and TS symptom severity should be measured at multiple time points if this outcome is being considered. The mechanism through which prenatal and perinatal events lead to TS onset or worsening tic severity is unknown. These factors could contribute to microscopic abnormalities in brain structure or function that lead to the development of tics. TS is a neurodevelopmental disorder which shares common features with autism and attention deficit hyperactivity disorder. Dysfunction of the dopaminergic system has been implicated in all three disorders, and evidence from animal studies suggest that prenatal stress may cause changes in the dopaminergic system [48–51]. The frequent comorbidity of these neurodevelopmental disorders in clinical practice suggests a common pathophysiological basis, with shared prenatal and perinatal risk factors in autism and ADHD supporting these relationships [52–54]. In conclusion, this systematic review provides weak evidence for an association between pre- and perinatal adversity and the onset of TS, comorbid disorders, and the severity of tics, ADHD and OCD symptoms. Of all the risk factors studied, maternal smoking and low birth weight appear to be most consistently implicated. Studies of higher methodological quality are needed in order to better understand the relationship between prenatal and perinatal events and TS. This study is part of the National Population Health Study of Neurological Conditions. We wish to acknowledge the membership of Neurological Health Charities Canada and the Public Health Agency of Canada for their contribution to the success of this initiative. Funding for the study was provided by the Public Health Agency of Canada. The opinions expressed in this publication are those of the authors/researchers, and do not necessarily reflect the official views of the Public Health Agency of Canada. Ting-Kuang Chao, Jing Hu and Tamara Pringsheim declare that they have no competing interests. TKC performed the data extraction and synthesis, wrote the initial draft of the manuscript, and made subsequent revisions to the manuscript. JH created and executed the search strategy for original research articles, reviewed all abstracts for inclusion criteria, and assisted with revision of the manuscript. TP obtained grant funding for the study, created the search strategy for original research articles, reviewed all abstracts for inclusion criteria, and revised the manuscript. All authors read and approved the final manuscript.